The ninth expansion for Crusader Kings II is available right now, and it allows you to take on the role of a nomadic society in the Eurasian steppes. The Horse Lords expansion adds the Tarim Basin and "large parts" of Mongolia to the game map, as well as nomadic governments. According to the write-up provided by Paradox, these nomadic governments are fairly different to sedentary ones. "You manage populations instead of holdings," reads the description, "and armies are raised based on population size." 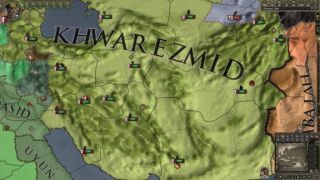 There's also over a hundred new events, new "dynamic trade mechanics and conflicts" thanks to the The Silk Road, and Mongol invasions have been reworked. The full list is below, and the expansion is available here. Tarim Basin and large parts of Mongolia added to map.